EZ Rider, the Toku guy and the riffmaster general of RVT co-hosting Toku Riffs Live and Ranger Recap. From his farmland fortress he uses his collection of Toku arsenal to defend against bad toku and the villains of the alliance. EZ hosts Toku Time, What the FAIZ of the Week, WHITWOT, and many more shows. EZ is a big fan of tokusatsu and wants to share his love with the world by bringing tokusatsu to the masses one show at a time. EZ is always seen with a wristband on his arm. It is not just a fashion statement. It keeps him alive. A long time ago a lab accident occurred that injured EZ greatly and apparently took the life of his older brother Paul. By a miracle EZ survived but the accident caused a rare virus to infect his body. A mystery figure fitted him with a wrist module that kept the virus at bay. If the wristband is damaged or removed the virus will spread and kill EZ in 15 minutes unless the module is returned or another is equipped. EZ lived his life pretty much the same after that event until he met the Imagin Akataros and the two formed a partnership over the terrible Imagin Anime. EZ and Rager became good friends and allies over time and fought together once Shadow Moon and the Vanity Alliance targeted them both. EZ constantly does battle with several alliance goons including Shadow Moon, Wolzard, Dark Rider and the revived corpses of the dead, called Wraiths. EZ Rider is calm and laid back most of the time but is known to have a temper during reviews and fights. He hates having this new destiny thrust upon him and often points out that he’s no hero, champion, or defender. He is just a farm boy who loves to watch shows from Japan and that’s all he would like to be. EZ is a lover of guns. His brother and father were experts with firearms and he was taught by Paul after their parents died in a house fire. His base weapon, also given to him by his brother, is his trusty Quantum Defender which never leaves his side. Luckily every time EZ reviews a bad toku movie or series he seems to gain more power. This has saved his life on several occasions. He has gained many new weapons along the way including a Leon Laser, Skull Magnum, and a Gokai Spear just to name a few. During the Reviewtopia invasion (MOONRISE) he briefly gained the power to become Kamen Rider Black RX and, with the help of a Decadriver, became Kamen Rider J to stop a giant Shadow Moon. EZ has been sent items by an unseen benefactor and even by friends and loved ones many times. 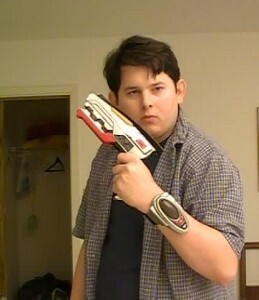 Recently he was able to configure a Transpod and once he obtained a Morphin Brace (after hearing his dead brother’s voice) he is able to activate it and become EZ Buster. With this new form he can access all his past weapons and new ones, including the Special Buster cannon which he used to defeat Dark Rider. After which he was branded a criminal for a murder he didn’t commit and has a price on his head. On Christmas Eve 2015, EZ was given a nifty holster for his Quantum Defender but soon after, he and the others were attacked by snipers and other bounty hunters attempting to claim the price on his head. Soon EZ made the announcement that they would be leaving the farmland fortress and seek refuge elsewhere. Where that is remains to be seen.